← Don’t Count Your Chickens …………. For about a year or so, I had been interacting with two young men on a group in WhatsApp. My contributions usually being witty or pithy comments with a great deal of detachment whereas theirs, more involved and passionate. The group is our local Alumni Association’s with membership running across a wide spectrum of age, gender, experience and ideologies. On an impulse, I had suggested a personal meeting to one of them last week and he readily agreed. Not only did he agree but, he also wondered if he could bring along another member, a colleague and personal friend of his. Having interacted with the other as well on WhatsApp, I readily agreed and they both called on me last evening. They stayed for a couple of highly stimulating hours which I thoroughly enjoyed and they assured me before leaving that they did too. The combined age of the two equals mine, or, in other words, both are half my age. Their world view and experiences are vastly different to what was mine at that age and the stresses and problems that they have to handle simply did not exist for me at that age. This remarkable difference in our life situations occupied most of our discussions and for me at least, it was a learning experience which, no amount of news paper or periodicals reading would have given me. Apart from such commonalities, the two had very different social backgrounds which in turn impact their current life styles in different ways but, in more of an understandable way as, these are universal and quite obvious. And that is the book that appears alongside. Before I decided on quite how to treat the book, I investigated the author and read up some reviews of the book and then sent off the book for binding as I do to books that I intend reading and keeping for repeated reference. My investigations as well as the first few pages that I glanced through before I sent it off for binding assures me that it will be interesting and I look forward to reading it soon. Since AK is bound to read this post, my question to him is “What makes you think that I either don’t or, do?” I hope that he will respond either off blog or here in the comments. In case he does off blog to remain anonymous, I shall share his response with my readers through another blog post. This entry was posted in Blogging, Friendship, Gratitude, Humor, WhatsApp and tagged Mark Manson. Bookmark the permalink. 14 Responses to An Unexpected Gift. 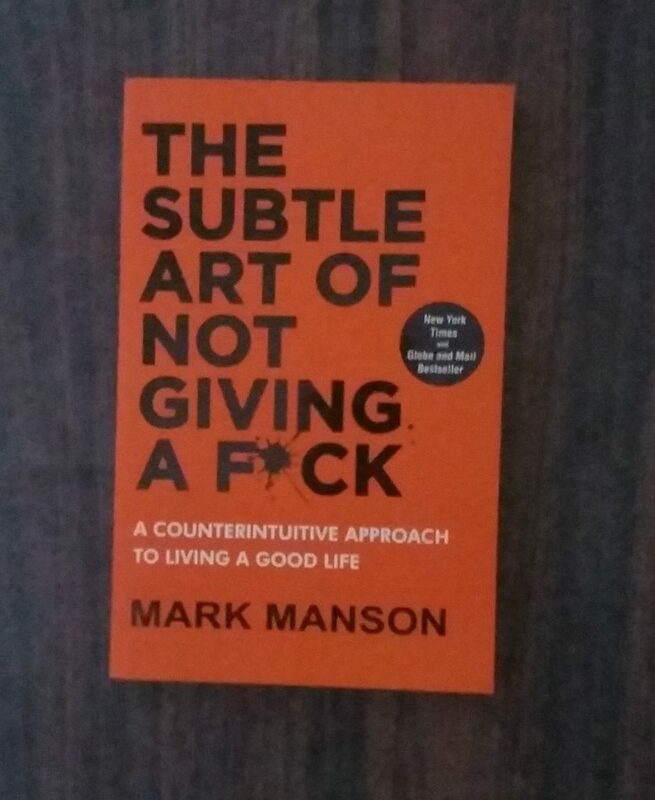 “The book is a reaction to the self-help industry and what Manson saw as a culture of mindless positivity that isn’t practical or helpful for most people”. I could kiss Manson. “MINDLESS positivity” – do I have nothing but disdain for it or what? Manson, no doubt, will be delighted to read your response. I intend reading it as soon as it comes back from the binder. I will decide later as to whether I should write a review or not. I read this book. It didn’t impact me at all, really. Maybe I’m unteachable or maybe I already concurred. I can’t go back for another read to see what I think now because it was borrowed from my son’s girlfriend. It may just be that you are not obsessed with being mindlessly positive! I’m looking forward to AK’s answer, and to hearing what you think of the book. I just read what Amazon has to say about it, and I’ll still stick with trying to turn lemons into lemonade when I can. Finding creative solutions is rewarding. AK has assured me that he will respond one way or the other. I will share his views with all my readers by another post. I had read the reviews in Amazon as well. Since I have got the book, I will read it and decide later as to whether I should write a review about it. My post acknowledging your response is up and flying! Thank you. I think I agree with everything he says. mister Manson I mean. though it’s unfortunate that he shares a last name with one of the most heinous psychopaths of all time! or maybe in this world of skewed values he likes that. I saw this book in Barnes and Noble last weekend. and I just read the amazon page where you can ‘look inside’ the book in question. to tell you the truth I actually believe everything he is saying. but I got so literally sick of hearing (reading) the F word and other nasty adjectives every other paragraph that I couldn’t keep reading. and you know I’m not a prude Rummy. it’s just that the constant use of swear words or dirty words or whatever they’re called these days was like trying to look at a painting through a muddy curtain. the beautiful clarity of each thought was overshadowed by the (in my mind anyway) supposed attempt by him to sound young and cool and hip and whatever… just to get his targeted (?) audience to READ it… well… it left this unprudish overaged reader disgusted. I recently read ‘Goodbye Things’ and it accomplished much the same without the potty mouth approach. although minimalist that I am I would be hard put at this age to live without sufficient furniture for these old bones! still. the concept of the western values and now apparently world~wide values of TOO MUCH of EVERYTHING = happiness in spite of living life to your own secret drummer… came across loud and clear. it’s that old concept for the masses… when is enough ever enough? but as long as they get it I am the last to throw cold water on it! as long as they GET IT! SH dearest Sean. looking forward to your own astute review! and now to read AK’s response in the link above. see ya in the trenches dearest bean! I have been warned enough about the liberal use of unparliamentary language by AK as well as the reviewers and now by you. As AK would probably say, I will go for the message rather than the language and then review the book. I just read AK’s post. and it was better I thought than the short pages of the book that I read on Amazon! I also will be interested in your response to #4 and 12 Rummy! as to this quote from it… it’s good. but I like this quote from Wayne Dyer better. “always try to be kind. and actually it would end the battle and bring peace. so… semantics! but there you have it. I’m a practicing Pollyanna at heart I suppose. Welcome to the club Catherine. All of us are usually forced to mellow down with our batteries running down. My COPD, much repaired hip joints and weight rule out battles any way! I can neither fight nor flee and therefore have perforce been demoted, shall we say, to Wayne Dyer’s ways. On the question of choosing Right however, I strongly believe that Right is a highly subjective idea and is not universal in its application.